Unlike a lot of the rest of economics there is a wealth of data on demographics, which makes it possible to test out some of the arguments currently being discussed in the media. There have been a number of articles in the press discussing the changing shape of demographics and how this impacts our economy. One of the theories is that the increasing proportion of the population in the age group 50-69 is having an impact on the saving behaviour. As this group are naturally hoping to save for retirement, a rise in their number would suggest more savers looking for a yield on their savings. With a higher demand for savings and a higher demand for bonds, property etc… we would expect prices to rise and yields to fall. This theory is used to explain the rise in asset prices and fall in yields seen in the UK, US and Japan. 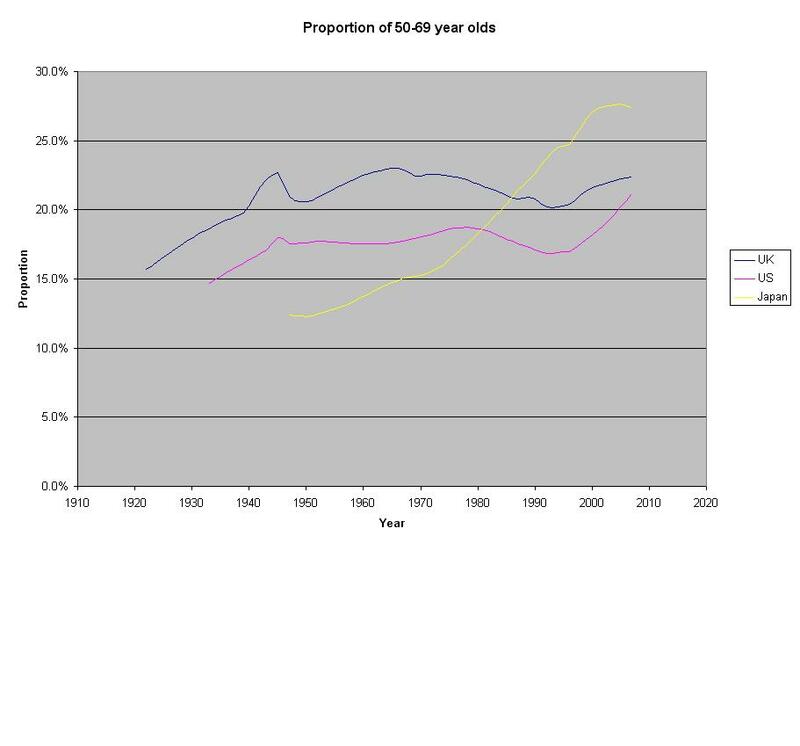 I have taken demographic data for the UK, US and Japan from www.mortality.org. The following chart shows the proportion of the population between 50-69. For the UK this proportion rose from 1922 until 1940; after which it has stayed between 20 and 23%. The US has shown a similar pattern with a slightly lower blip during the Second World War and a slightly higher rise after 1990. Japan has had a different pattern of a constantly rising proportion only peaking in 2006. It seems difficult to me to see how the banking crisis or current low yields in the UK are due to demographics. In the UK the proportion of population between 50 and 69 was highest between 1965 and 1975 and yet interest rates ran well into double digits in this period. If we can dismiss demographics as a significant impact on yields in the UK – is it then credible to discuss it in other nations? Some other factor aside demographics must be impacting the yields in the UK. I would contend it is this factor (or factors) that should be explored rather than focusing on demograhics.